For the past two days Kim has been running the ship as Flo n Daisy were bedbound. On Tuesday, Kim served up a smashing leek and potato soup (albeit accidentally oversalted by a zealous child) and on Wednesday was joined in the kitchen by Reggs to make a Mexican(ish) chicken broth soup with rice which, again, was a hit. (Correction: “super hit” – Reggs). But today, the three of us were back together in the kitchen, and stronger than ever. Still thinking about possible “British” dishes, and being too lazy (and pushed for time) to make a shepherd’s pie with mashed potato, we decided on a veggie cottage pie. And it was a winner. We had an early start to the day as we had two meetings before lunch so had to prep everything in advance. 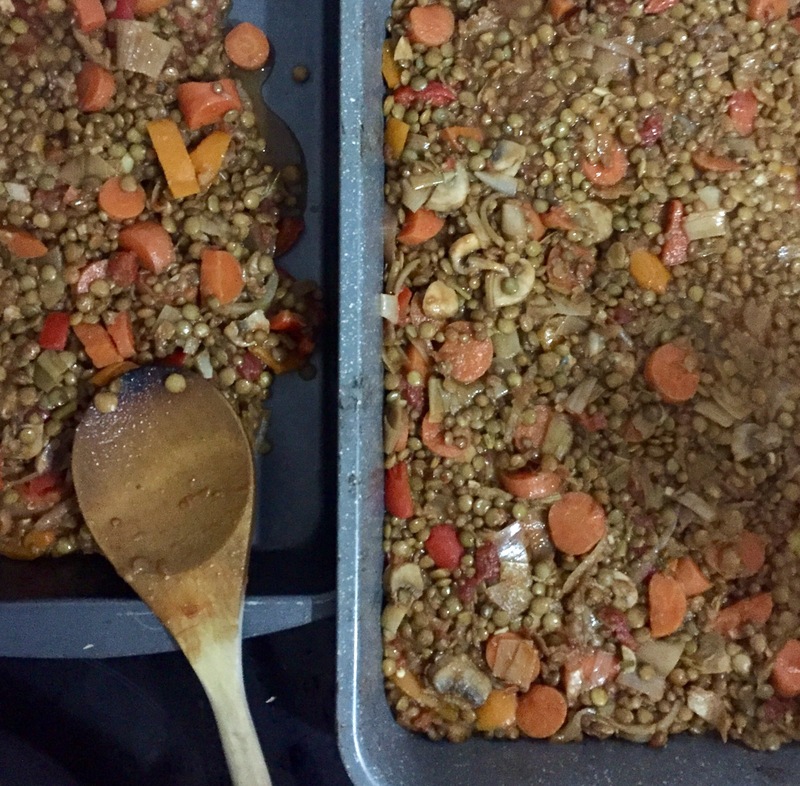 Lentil mixture simmering away, we headed to The Cube, an impressive nine-floored incubator/co-working space/hub for start-ups and NGOs, not far from the OH. Amongst hundreds of other things, they run accredited computer and coding clubs for young displaced people in Athens and have a makers’ space downstairs (complete with sewing machines, tools, materials etc.) for people to use. After a quick tour of the building we met with Ioanna, the founder of Campfire Innovation, a start-up looking to connect and empower grassroots aid organisations, to encourage innovation and to advise on efficient practices. She introduced us to their ‘smart aid’ guidelines, which they are sharing with organisations to help ensure efficiency, decency, replicability and informed use of technology. Ioanna told us about her time in Lesvos and Thessaloniki where these principles will soon be implemented in order to maximise efficiency in aid distribution, communication between organisations, and warehouse logistics. We left feeling very excited and inspired to find an opportunity to put smart aid to use. En route back to the OH we stopped by the Greek Council for Refugees, to make an appointment to meet with a lawyer there. We have been shocked and saddened by the situation in Athens for unaccompanied minors and are finding out everything we can about the process of resettlement for those without family ties in the U.K. The Dubs Amendment is still ambiguous and is not happening as quickly as it can and should be, and we want to find out why. 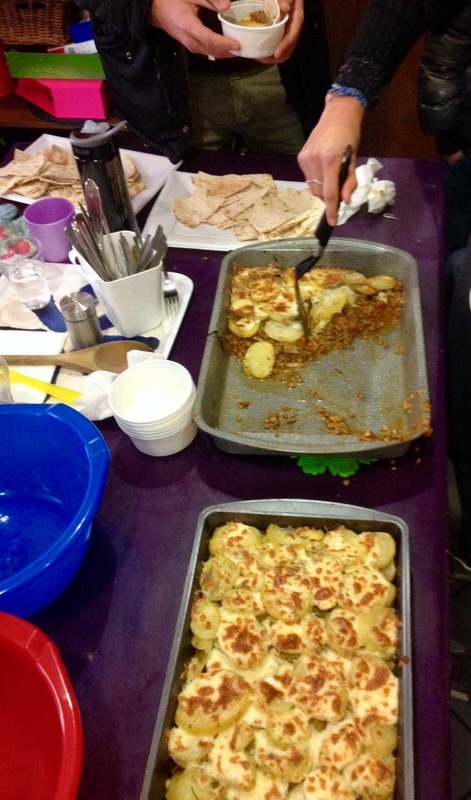 Heads buzzing, we arrived back to the kitchen to assemble and cook the cottage pie. After the varied reactions to the last “British” meal we served, we were expecting some sceptical looks when we carried the dish upstairs. To our amazement, the whole thing disappeared quicker than you can say “Catch It If You Can Cottage Pie”. There was not a lentil left in sight and no cries of “mileh, mileh” (“salt, salt”). Unexpected thing number two: ten year old Ahmad did ALL of the washing up, instructing people to put their bowls in the soapy water and delegating cleaning up tasks to his four brothers and three cousins. The reason this was so unexpected was that Ahmad has never offered to help before. Up until this point, everything he has said to us has been preceded by “Look, you, gimme one…”, usually followed by book, pen, pizza, spoon. Today though, he happily stood cleaning whilst his little brother rinsed and dried, winking at us as every time he said “Look, you, gimme one bowl” to the younger children. It was heartwarming to watch Ahmad take charge of washing up, and gave us confidence that lunchtimes will be in safe hands after we’ve left. You may notice that this post is somewhat lacking in photos. This is because Daisy’s phone, with all of the photos of Catch It If You Can Cottage Pie, was stolen on Tuesday evening. So unfortunately we’re left with Flo’s not so appetising photo attempts. She promises she’ll try harder now that we’re one phone down. Add lentils, tomato, stock, water and herbs n spices. Bring to a boil then turn off whilst you nip out for a few hours..